Decommissioning nuclear facilities is a relatively new field, which has developed rapidly in the last ten years. It involves materials that may be highly radioactive and therefore require sophisticated methods of containment and remote handling. The wastes arising from decommissioning are hazardous and have to be stored or disposed of safely in order to protect the environment and future generations. Nuclear decommissioning work must be carried out to the highest possible standards to protect workers, the general public and the environment. This book describes the techniques used for dismantling redundant nuclear facilities, the safe storage of radioactive wastes and the restoration of nuclear licensed sites. Describes the techniques used for dismantling nuclear facilities, safe storage of radioactive wastes, and the restoration of nuclear licensed facilities. Provides the reader with decommissioning experience accumulated over 15 years by UKAEA. 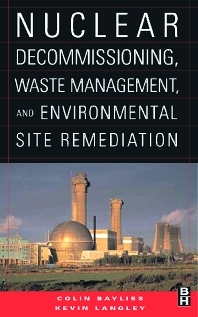 Contains valuable information to personnel new to decommissioning and waste management. Dr. Langley is head of Technical Services Group within the Planning, Performance and Engineering Division of the United Kingdom Atomic Energy Authority (UKAEA). Dr. Langley obtained a PhD in physical chemistry from Queen’s University, Belfast and has worked in universities and industry both in the UK and Australia, until joining the UKAEA in 1978. He has managed a broad range of projects on renewable energy technologies and nuclear fuel processing, including strategic studies. Since 1990 he has been involved in various capacities with managing the decommissioning program at Harwell and other UKAEA sites.